Handmade paper gift baskets for those special ceremonial occasions, are made with handmade paper and adorned with golden satin lace. These are 100% Natural Bamboo products and are handcrafted. 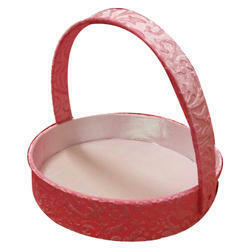 This product is best suited for Gift hampers. In our exquisite line of artistic and gift items, we have high quality Handcrafted Gift Baskets. These gift wrapping articles are highly attractive and give most fascinating designs and finish to the products packaged. 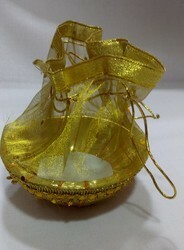 These gift baskets can be covered with handmade using paper or cloth as per the clients’’ requirements. These hamper baskets are perfect for elegant storage. These baskets vary slightly in size from approximately 14" tall x 12" in diameter. To care for baskets: Clean with soapy water and scrub with soft brush. Set in the sun, and allow the basket to dry thoroughly.